Enough readers have emailed me and asked about my autographed boots, that I felt like I should explain how the whole boot-signing got started. Back in 2003, I was at a Kenny Chesney concert in Milwaukee. My friends and I were perfecting the art of seat-hopping, and had gotten ourselves pretty close to the stage. So when Kenny came back out and started signing, we started frantically looking around for something he could autograph. My friends Jill and Maureen yelled, "Give us your boot!" I slipped my red Justin boot off, and they threw it up to Kenny. And then Keith Urban. 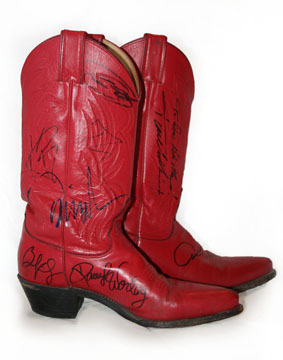 From that day forward, I've worn these red boots to every concert I've been to. And every time I'm near an artist with a Sharpie, I get them signed. They've been signed in cities from Milwaukee down to Rayville, Louisiana. From big venues to alleys behind small bars. I've had plenty of offers from drunk cowboys to buy them off me. But I don't have any certificates of authenticity to prove that the autographs are real. All I have is the memories of how good it felt every time it happened.